Jonathan Holmes, a 2003 drum major for the Blue Devils, took the time to be the subject of today's "Aria" interview. DCI.org: Give us some background information on yourself. become one, and why? Holmes: My freshman year of high school was when I decided to become drum major. 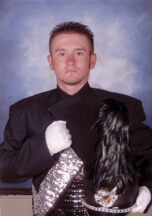 My first year as drum major was my sophomore year at Buchanan High School. Some of the staff at my high school had marched Blue Devils at one time or another, and that was the main reason why I chose to march with them. Another reason I chose to embark on this position was the load of responsibility that would go along with it. I love a good challenge. DCI.org: In the winter, how do you prepare for the summer's drum major responsibilities? Holmes: In the wintertime most of our responsibilities consist of administrative stuff. Also this is when we begin to set the tone for the season. We also develop the "personality" of the corps. Jon Benson and I also begin to conduct with what little time we have to try to "mirror" each other as much as possible. We also set up meetings with the leadership of the corps to dissolve problems that may come up. DCI.org: How would you describe the drum major audition process? Holmes: The process in which the drum major is chosen is carefully done. We will have the auditionee conduct a segment of the previous years' show. But the big majority is how a candidate handles himself, and how he handles the corps. We also undertake a lengthy interview to find out how we would resolve situations and deal with the corps, basically in a question-and-answer format. DCI.org: Besides the Blue Devils, what are some of your other interests? Holmes: Although drum corps is a big part of my life, it does not consume all of my time. I am currently working toward my black belt in kung fu. I like to spend as much time as possible with my family and my girlfriend. I also attend church as much as possible, but those Sunday rehearsals only allow so much. DCI.org: How would you describe the leadership and management of the Blue Devils? Holmes: The way the Blue Devils' staff has operated for many years is to treat you like a professional on and off the field. The staff always has the right answers the first time. One major reason why people join the Blue Devils is simply because of the way the corps is run. Dave Gibbs (corps director) is always there with inspiring words to keep us going through the year. His door is always open to talk about any circumstances. I can go down the list and describe how the Blue Devils run everything, but our motto sums it up: "A commitment to youth." DCI.org: How would you describe your own leadership style? Holmes: As for my own leadership style, I like to run things just like a major corporation. After all, that is basically what I am. I am always doing what is best for the organization. I often meet with my "board of directors" (section leaders) to find out what is exactly going on with the corps internally. One major thing I believe in is leading by example. In this role you cannot place yourself on some high shelf. I am a part of the 135 on the field. Jon Benson and I always make sure we are on the same page. Thus, communication becomes a big aspect of the leadership style. But not just communication with my drum major partner -- we also undertake heavy doses of communication with the corps, staff, and even the fans of drum corps. DCI.org: During the winter, do the Blue Devils' drum majors keep in close contact with each other? Holmes: Most of this last winter, one of the drum major spots was open. But as soon as it was decided that Jon was going to be my partner, we immediately sat down and discussed our goals for the year. We are always talking about upcoming issues that may occur and attack plans -- it is always good to be prepared. A big part of this responsibility is communication between the drum majors, which have been taking place since day one. DCI.org: What during the summer are you looking forward to the most? Holmes: During the summer there are many things to look forward to. The one I am looking forward to the most is finals night. For one simple reason -- that will be our peak performance. Throughout the year we all wonder if we will ever be as good as we think we can be. At that moment when we walk of the field on finals night we will have peaked and the months of practice WILL have paid off.